Four Driver Update Utilities: Which Ones Can You Count On? Don't be fooled by its name: DriverUpdate isn't simply a utility for keeping drivers up-to-date. It handles that task, certainly, but it also does more. This $30-per-year program streamlines the process of updating your Windows OS, as well as those apps, like Java and Adobe products, that frequently seem to be in need of updates, too. DriverUpdate alerts you to drivers in need of updates, and also identifies software updates for your PC. DriverUpdate is made by SlimWare Utilities, the same company that produces the free SlimDrivers product. SlimDrivers focuses solely on drivers, and only allows you to update one item at a time. For $30 a year, DriverUpdate adds the OS and software updating capabilities, as well as the ability to apply multiple updates with a single click. Rivals PerfectUpdater and DriverScanner, each of which costs $30 for a one-year subscription, focus solely on drivers, too, but do allow you to update multiple drivers at once. SlimUpdater and DriverUpdate do share plenty of similarities, which is a good thing. Both use SlimWare's cloud-based approach for identifying the right updates for your PC, which resulted in quick and accurate scans of my Windows 7 PC. 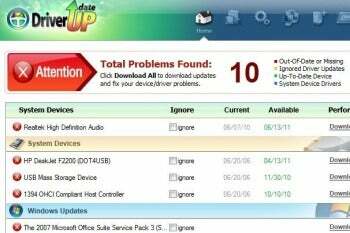 DriverUpdate accurately located 10 fixes for my computer, including 9 drivers and one Microsoft Office Service Pack (available via Windows Update). Like its free sibling SlimDrivers, DriverUpdate features a neat and clean interface, which tells you the date of when your driver was updated, as well as the date when the most current version was made available. Applying updates is a breeze, whether you choose to install one at a time, or all in one fell swoop. You can choose to ignore suggested updates, too, so you won't be reminded of them every time you run a scan. If you're interested in updating only your drivers, you don't need to shell out the $30 per year SlimWare charges for DriverUpdate. The free SlimDrivers handles that task with aplomb. But if you like to manage multiple products from one place, DriverUpdate is easily up to the task. DriverUpdate not only updates your drivers, but also helps keep your Windows OS and some key applications up to date, too.